Wachirawit Darakantrong was born on September 11, 2013, with a complete bilateral cleft lip and cleft palate, and lives in Roi-Et Province, Thailand. The nurse at Roi-Et hospital registered him online and referred him to the Tawanchai Cleft Center in order to receive further treatment. Wachirawit’s mother, Ms. Ornwipha Thunglat, says that she was initially “frightened and full of sadness” because her ultrasound had not detected the cleft lip and palate. In addition to her son, she learned that her husband’s brother has a cleft lip and cleft palate. 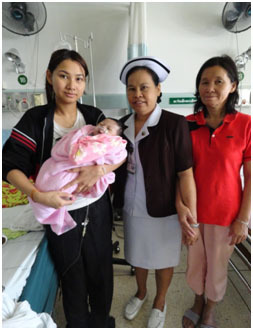 Roi-Et Hospital coordinated and referred her case to the Tawanchai Cleft Center in order to receive medical treatment.